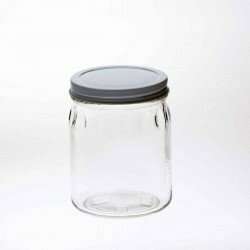 An extra wide mouth half gallon jar: squatter and wider than the average jar of this capacity.Perfect for a range of uses including fermented foods, bulk pickles, and even just as a vase!The extra wide 110mm mouth makes it easy to get food in and out, as well as making it easier for cleaning purposes.Lids are foodsafe coated metal MADE in the USA Capacity 64oz (approximately 1900ml) Takes Lid 110mm CT Height 16cm Outside diameter 14cm Label panel height 7.4cm Outer circumference 44.8cm Colour may vary according to availability, please contact us if colour i..
French Square Dairy Bottles (also known as French Squares) are a space saving and elegant way to present and store a range of products.Traditionally used in dairies for storing milk, these jars can also be used to store dry foods, sauces, body lotions and more.The 8 oz size is also a very popular way to serve milk, juice and kefir. MADE in the USA Capacity 8oz (approximately 240ml) Takes Lid 43mm CT. Note that these are not compatible with twist top lids. Lid colour may vary according to availability, please contact us if a particular lid colour is required. ..
French Square Dairy Bottles (also known as French Squares) are a space-saving and elegant way to present and store a range of products.Traditionally used in dairies for storing milk, these jars can also be used to store dry foods, sauces, body lotions and more.These jars have also become a popular way to serve juice, milk and kefir.MADE in the USA Capacity 16oz (approximately 450ml) Takes Lid 48mm CT. Note that twist top lids are not compatible with these bottles. Lid colour may vary according to availability, please contact us if a particular lid colour is required. ..